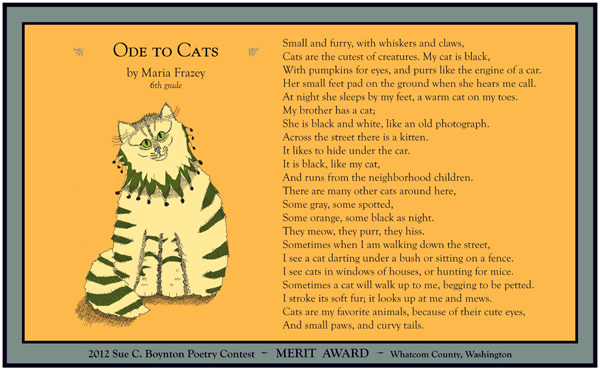 Congratulations to Dorothy Regal, a 2009 Sue Boynton Poetry Contest Walk Award winner, whose new collection of poems, A Measure of Strength, has just been published by Other Mind Press. Dorothy Regal will read from her book on Saturday, August 11, 2012, at 4:00pm at Village Books and her book is available now at Village Books. Write or Die is not new, but if the word “June” or “July” on your calendar is a distraction, maybe this “writing productivity application” will help. Available for iPad or desktop, this app is essentially a sharp stick that delivers a poke when you stop writing. Like National Novel Writing Month (NaNoWriMo), the intent is not refined text or editing, but getting-it-out-of-your-brain-onto-the-screen quantity. In fact, to save, or to do any editing, you need to copy and paste the text from the app into your text editor. wild life having a boundary of its own. 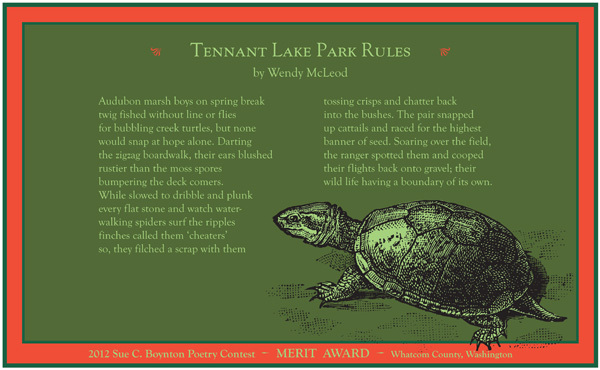 *Copyright 2012 by Wendy McLeod. Placard design by Egress Studio. Here’s another destination for your poetry map. Known as “the Mural Town of New Zealand” and the gateway to the Bay of Plenty, Katikati is “just a half hour’s drive from Tauranga, ninety minutes from Hamilton and Rotorua, and two hours from Auckland and Taupo.” In addition to its murals, Katikati is known for its Haiku Pathway. By the end of 2007, the Pathway had 30 poem boulders and to mark its tenth anniversary, ten more stones were engraved and installed along the river-side route. 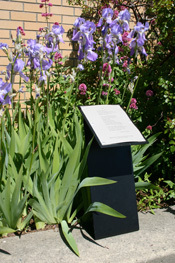 Learn more about KatiKati and the Haiku Pathway here. I’m sure something like this has happened to you. of something you recognize, something much larger. one large, the other small, yet the same. with the wonder of what is behind it all. a point beyond our knowledge. reaching out to others to form something new. that are but the semblance of beauty itself. here on a dusty trail. 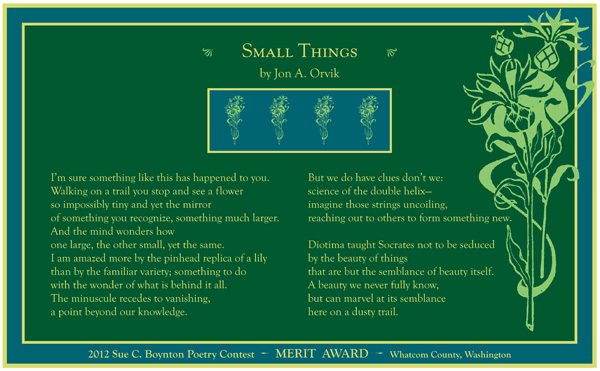 *Copyright 2012 by Jon A. Orvik. Placard design by Egress Studio. With pumpkins for eyes, and purrs like the engine of a car. Her small feet pad on the ground when she hears me call. At night she sleeps by my feet, a warm cat on my toes. She is black and white, like an old photograph. Across the street there is a kitten. It likes to hide under the car. And runs from the neighborhood children. Some orange, some black as night. They meow, they purr, they hiss. I see a cat darting under a bush or sitting on a fence. I see cats in windows of houses, or hunting for mice. Sometimes a cat will walk up to me, begging to be petted. I stroke its soft fur; it looks up at me and mews. And small paws, and curvy tails. *Copyright 2012 by Maria Frazey. Placard design by Egress Studio. Get Clover at Village Books and Copies Now in Bellingham and online at the Independent Writers Studio. If you’re on Facebook, you can Like Clover there, too. Get some Clover.